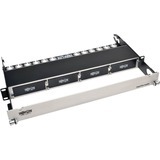 Tripp Lite's N484-12M12 is a High Density 40Gb Pass-through Cassette, with (x12) 12-Fiber MTP/MPO connections. Designed specifically for use with Tripp Lite's N484-00U and N484-01U chassis'; up to 4 cassettes per N484-01U, or 1 per N484-00U. 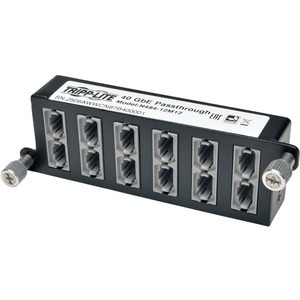 Each MTP/MPO connector is rated for up to 40GbE, with an extremely low insertion loss of 0.35db, well under the IEEE-802.3ae maximum channel loss spec of <25db. 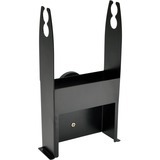 Guaranteed compatibility when used with recommended Tripp Lite cabling. Designed specifically for use with Tripp Lite cables, such as the N842- and N844-Series cables. Installation is simple, with the cassette being easily installed or removed using screw tabs to lock or unlock it from the panel; no tools required. 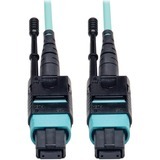 Furthermore, each cassette features factory terminated connectors that reduce the time and labor required of field connector terminations. Cassette housing made with heavy duty, 1.0mm Cold Rolled Steel. Guaranteed compatibility when used with recommended Tripp Lite cabling. Designed specifically for use with Tripp Lite cables, such as the N842- and N844-Series cables.